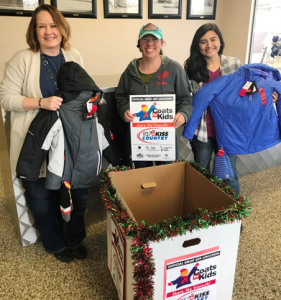 Purl’s Sheet Metal & Air Conditioning wrapped up the 2018 Coats for Kids drive. We enjoyed working with our customers, community and our local schools. We give a big thank you our partners at Saint Joachim School. The students and parents brought in numerous coats. We are proud to announce we collected over 300 coats. All of the coats collected will stay in Madera County and will be distributed by our local Salvation Army Office. We want to thank our customers and friends who brought in both new and slightly used coats for this drive. Thank you to the teachers, parents and students at St. Joachim Schools! We were overwhelmed by the donations and generosity. Huge thank you to our local Salvation Army for all the great work they do! All of the coats collected will be given to children who need them most in the local San Joaquin Valley. At Purl’s Sheet Metal & Air Conditioning, “Quality Is the Cornerstone of Our Success” since 1952. Leave all your heating repairs to our experts.